A leading Contract Research and Development Organisation (CRDO) – Arcinova has invested in a Uniqsis FlowSyn™ continuous flow reactor enabling them to develop and simplify the scale-up of a challenging API batch process. Following a trial of the FlowSyn™ system – Arcinova could justify their investment based upon rapid synthetic method development and the considerable cost and time savings demonstrated versus using large scale reactor vessels for the selected process. Dr. Samuel Bourne, Continuous Manufacturing Lead at Arcinova commented “Installation of a FlowSyn™ has enabled us to produce multiple kilograms of an API intermediate which was very challenging in batch. We were able to rapidly optimise the process on milligram scale – resulting in a >10× improvement in space time yield versus batch – then scale up immediately, reducing our R&D and manufacturing time by over a month. We found the system easy to use and the technical support from Uniqsis has been excellent”. 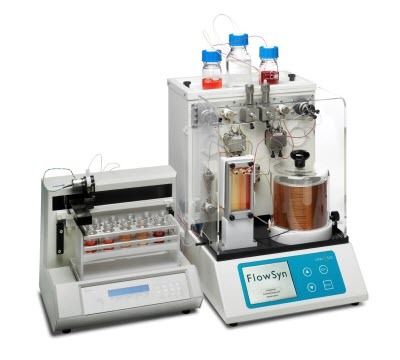 The FlowSyn™ is a compact integrated continuous flow reactor system designed for easy, safe and efficient operation. The FlowSyn™ range includes models for performing single or multiple homogeneous or heterogeneous reactions, either manually or automatically. The range of reactions that can be explored with Uniqsis’ integrated and modular flow chemistry systems grows ever wider and is exemplified by the growing number of applications published both in the academic press and in Uniqsis’ own application notes. Typical examples of flow chemistry applications include hydrogenation, nitration, bromination, metalation, molecular rearrangements and synthesis of compounds such as dihyropyridine, indole, pyrazole, quinolinone and benzimidazole.